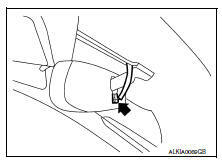 Insert a suitable tool (A) under the inside mirror (1). Slide the inside mirror upward while pushing down on the pawl. Do not reuse the inside mirror disassembled from inside mirror base. Do not use excessive force to remove the inside mirror. Wrap a suitable tool with a shop cloth to avoid damage to the windshield glass. When installing the inside mirror on the mirror base, be sure to push the pawl until it is tightly connected to the mirror base. Remove the mirror screw from the mirror base. 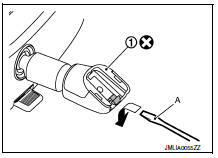 Disconnect the harness connector from the mirror. Slide the mirror upward to remove.